Transferable skills are one of the flavours of the month in education theory. At first glance, this looks sensible. If you ask experts in a wide range of academic fields about key skills in their field, they’ll usually mention writing as one of those key skills. So far, so good. At this point, though, things usually start to go wrong. Here’s a diagram showing a common belief about how writing works across different fields. 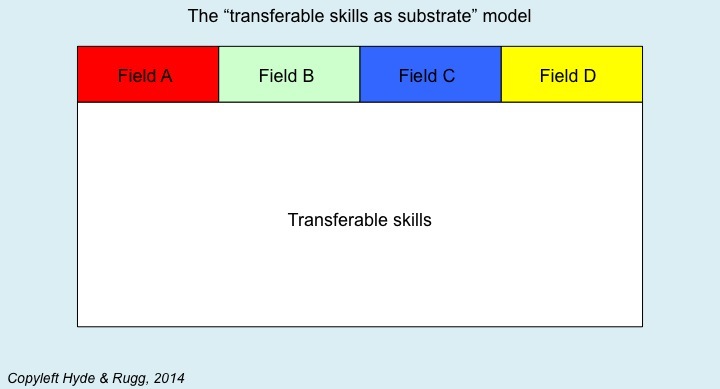 In this model, there’s a deep shared substrate of skills, shown in white, that are shared by all of the specialist fields represented by the coloured boxes at the top of the diagram. The implication is that the early stages of education can teach those transferable, shared skills, and that the more advanced stages of education can teach the field-specific skills which sit on top of that substrate. It looks sensible and plausible. That, however, isn’t the same as being true. So what happens when you look at the evidence about specialist writing? The answer is that specialist writing isn’t a few extra features stuck on top of generic “good writing”. The key features of specialist writing in different fields run deep, and often in contradictory directions across different fields. This applies even to principles that might appear essential for any type of writing, such as making a piece of writing interesting or persuasive. The reality looks more like the diagram below, where each field is different all the way down, with occasional fragments that are similar, but not identical, across different fields. In the following sections, I’ll look at some common beliefs about “generic good writing” and see how well or badly they map on to reality. One of the opening lines that external examiners in the sciences quite often use in PhD vivas is: “This was an interesting read”. It’s a line with a lot of sub-text, and you can tell a lot from a candidate’s response when they hear it. A strong candidate will immediately look wary, but not frightened. A weak candidate will look frightened. A clueless candidate will completely miss the sub-text, and look pleased. So what’s going on there? The sciences are very, very twitchy about interesting writing. The case of Franz Anton Mesmer highlights the reasons for this twitchiness. This is the same Mesmer who invented mesmerism. His underlying idea was that a form of natural magnetism ran through everything in the world; he believed that the flow of the magnetism could be blocked, and that this could lead to illness. He further believed that blockages could be cleared by using the correct form of magnetism. He was immensely popular and fashionable in the late 1700s, and his approaches appeared to produce some dramatic results. He was a great showman, which helped him considerably. He was also generous and public-spirited; for instance, he “magnetised” trees so that people unable to afford his full treatments could hug the trees (yes, literally) as a cheap way of clearing at least some of their blockages. Then, in 1784, Louis XVI commissioned an inquiry into Mesmer’s claims. The inquiry included some of the best and brightest minds of the time, including Benjamin Franklin. The result was a devastating take-down of Mesmer’s claims, using some classic experimental techniques, which showed clearly that those claims didn’t stand up to rigorous testing. In one particularly striking example, the commission offered some “magnetised water” to one of Mesmer’s patients, who immediately went into the convulsions common in those circumstances; when she came out of the convulsions, she gratefully accepted the drink of water they offered her. Except, of course, that the committee had initially offered her ordinary water, and had offered her “magnetised water” afterwards. As a result of experiences such as this, science researchers are very wary of plausible, charismatic characters; we’re equally wary of plausible, charismatic writing. We’ve seen too many cases of this type of writing being used to distract the reader’s attention from deep flaws somewhere else in a document. So science writing that’s written for fellow-scientists is deliberately dry and understated in its style. That’s good for the field. It’s also good for the researcher; if you use this approach, then you’re much less likely to encounter problems when some of your work turns out to be wrong. There’s a very different issue about interesting results, as opposed to interesting writing style. Interesting results are a very good thing indeed. However, they come out of factors such as research design, not out of writing. A classic example is the closing section of the paper in which Crick and Watson first described DNA. They were very well aware that this was one of the most important discoveries in the history of biology. Here’s the last sentence before the footnotes. That’s one of the biggest findings in biology, and also one of the most deliberately understated pieces of style that you’re ever likely to encounter. Which is precisely why I use it as an example of best practice in my lectures on academic science writing. So, interestingness in writing style hasn’t fared too well as a transferable skill. What about some other common beliefs? As you might have guessed after reading the previous section, the idea that writing should be persuasive isn’t popular in academic science writing. In science, the evidence and the methodology should be persuasive, not the writing. When you see persuasive writing in science, you immediately wonder what weaknesses in evidence and/or methodology the writer is trying to distract you away from. Another problem with persuasive writing is cherry picking. 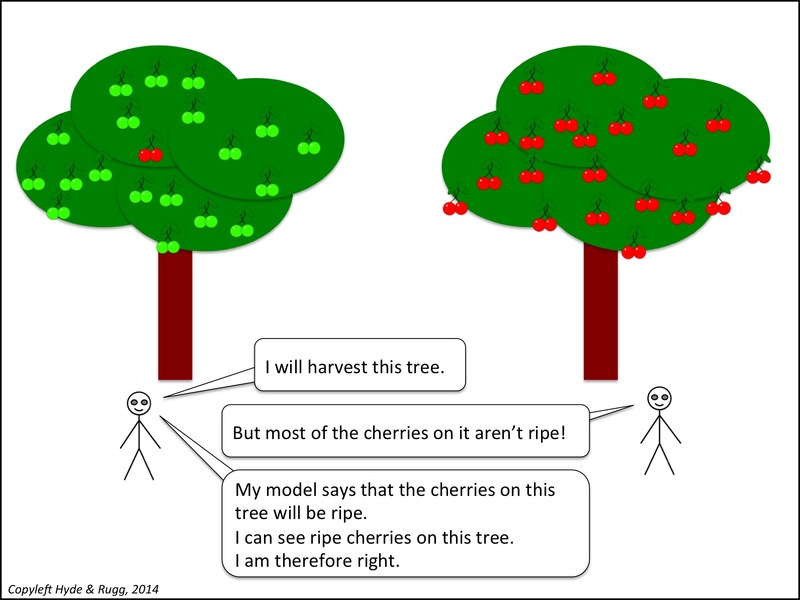 I’ve blogged about that before; I’ll use a cartoon from that article to illustrate the main problem with cherry picking, i.e. misleadingly selective use of only evidence that supports the writer’s claims, without any mention of counter-evidence that may be devastating to the writer’s claims. A closely related issue involves writing being informative. Being informative is generally agreed to be a Good Thing. That’s not a problem. The problem is deciding what to be informative about. That takes us into concepts such as framing and agenda setting and, again, cherry-picking. It also takes us into the concept of writing between the lines, the counterpoint to reading between the lines. The three classical authors that I’ve been writing about recently – Thucydides, Herodotus and Caesar – show three very different framings. Thucydides attempts to give as accurate and impartial an account as he can of a major war, with the explicit reason that he believes the same basic issues will underpin future wars, so his account might help us better understand what’s going on. It’s a bleak, austere framing of trying to make sense of a cold, impartial universe. He focuses on being informative about the causes of the war, and the causes of the events in the war, and on being as even-handed as possible in his descriptions of the participants, even though he fought on the Athenian side, and lived for years in exile in Sparta. Herodotus, in contrast, is telling a big story about ancient Greek exceptionalism. The implicit framing of his story is about exotic foreigners as a counterpart to the glories of Greece. He’s happy to describe some foreign customs that he thinks better than the ones back home, but the overall agenda behind his writing is demonstrating how good Greece is. Caesar has a very different agenda. It’s about self-promotion. When you start looking carefully at his writing, then you start seeing patterns in how the bad news is presented. Often, it’s in terms of “So-and-so disobeyed orders, and was massacred by the enemy”. The between-the-lines implicit message is that if only they had done what Caesar said, everything would have been fine. Sometimes Caesar uses another strategy to deflect criticism. Instead of blaming someone else, he diverts the reader’s attention by being informative about something else, such as colourful stories about unicorns, or about elks that don’t have knee joints. It’s the upmarket equivalent of shouting “Squirrel!” and pointing at something distracting. What was he distracting the reader from? Among other things, the war that he waged in Gaul and Germany was a vastly destructive war, effectively genocide, that he carried out with weak justification, if any, to build up his own fortune and power. He had much to divert attention from, but the reader can easily lose sight of that in the excitement of the story he tells. This is an issue that historians know all too well: history often involves very different possible framings for the same episode, and the choice between those framings, even for wars millennia ago, can cast a long shadow into present-day political debates. Our next example of a counter-intuitive principle also comes from politics and warfare. It involves the English Civil War, which wiped out a high proportion of the men of military age in the countries involved (it wasn’t just an English affair). When the war was over, and Cromwell had died, and the Protectorate was replaced by the Restoration monarchy, a lot of constitutional issues relating to the fine details of parliament’s relationship with the monarchy were unclear. Charles II was no fool, and nobody felt much in the mood for re-fighting the Civil War, which would quite likely have been the outcome if anyone had tried to spell out explicitly what those fine details should be. So, in a fine example of practical politics, many of those issues were carefully obscured with vague phrasing, and left for someone else to sort out if that ever turned out to be absolutely necessary. So, vagueness in writing can sometimes have its uses. Those occasions are rare, but when they do occur, they are often important. Again, this is usually true. Ambiguity is usually much more dangerous than vagueness, because vagueness is usually easy to spot, but ambiguity is very easy to miss. You see one clear interpretation, and you miss another, very different, clear interpretation. There are, however, some exceptions. One field that makes extensive use of ambiguity is entertainment in the broad sense – scriptwriting, fiction, and related fields. Often a key feature of the plot is an ambiguity. You see this in Macbeth, with the ambiguously worded prophesy about “No man of woman born” and you see it in every comedy of errors, and you see it in horror movies when the dark second meaning of an apparently innocuous phrase becomes apparent. In consequence, being able to craft a plausible and powerful ambiguity is an important skill for writers of fiction. This idea sounds fine, up till the point where you try to decide what counts as jargon and what counts as a necessary, precise, technical term. Usually, when someone complains about “jargon” it’s another way of saying that they don’t understand the complexities involved in a topic, and that they don’t want to be told that the topic really is more complex than they think. So what’s left as a fully transferable writing skill? Expert writing is like any other branch of expertise. There’s a substantial literature on expertise, and a consistent finding is that expertise is brittle and subject-specific. This applies to expert writing. The skills and knowledge required for expert writing are subject-specific; some fields may share some writing skills and knowledge with others, but there isn’t a vanilla-flavoured generic substrate of “general good writing”. 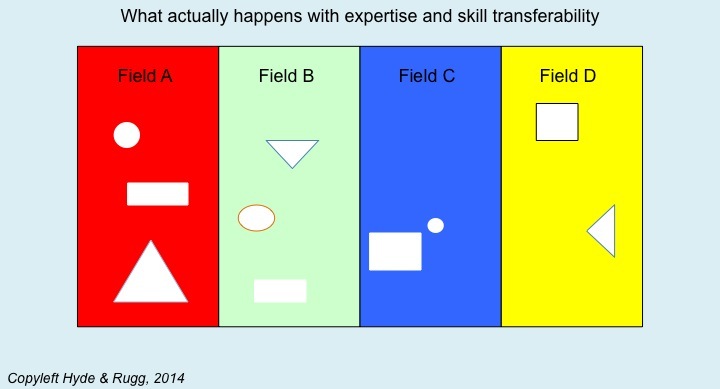 Having said that, some skills are transferable across a surprising range of fields. They’re not transferable across every field, though, and they’re often not the sort of skill that people usually think of in this context. This is something I’ve been investigating as part of my interest in craft skills in the broad sense. Here’s an example of a low-level craft skill that occurs in a wide range of apparently unrelated fields. If you want to know whether an object is internally flawed, you ping it, i.e. you hit it, and listen to the noise it makes. If it makes a clear ringing noise, it’s unflawed; if it makes a dull flat noise, then it’s flawed. I encountered this in archaeology, when learning how to make flint artefacts; you ping the flint to find out if it’s good quality. I met it again in bronze working, as a way of assessing scrap metal. In traditional railways, the same method was used to check for flaws in metal wheels. Dentists use it to check for cracks in teeth and fillings. It’s surprisingly transferable, but this particular skill isn’t likely to feature prominently in any major education initiatives in the near future. So, in summary, the idea of transferable writing skills looks attractive at first sight, but when you look at the details of the writing skills required in different disciplines, you soon realise that there are profound differences between the writing styles in those disciplines, and that schemes to teach transferable writing skills are at best a waste of resource, and at worse counter-productive. This is an issue that’s already causing needless trouble. I’ve spent more time than I care to think about explaining to students why they need to set aside writing principles they learnt at school, and why computing uses some profoundly different key principles in writing, such as deliberately not being interesting or persuasive. I’ve also had to spend more time than I care to think about explaining to students that no, this doesn’t mean that what their schools taught them was wrong; instead it’s more like the difference between a boiler suit and an interview suit, where each one is designed for a completely different purpose. If you try to clean a gunky engine in an interview suit, or go to a job interview in a boiler suit, then you’ll probably get what you deserve. It’s an important principle, but it’s not as widely known as it should be. I’m aware of the debate about Franklin’s role in the discovery of DNA. The full story is complicated and messy, which is why I haven’t gone into it. This entry was posted in craft skills, education theory, expertise, our research, Uncategorized and tagged academic writing, agendas, framing, mesmer, scientific writing, transferable skills, writing styles by hydeandrugg. Bookmark the permalink.